Nicholas Edward "Nick" Cave (born 22 September 1957) is an Australian musician, songwriter, author, screenwriter, and occasional film actor. 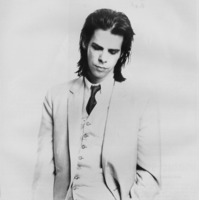 He is best known for his work as a frontman of the critically acclaimed rock band Nick Cave and the Bad Seeds, established in 1984, a group known for its eclectic influences and musical styles. Before that, he had fronted the group The Birthday Party in the early 1980s, a band renowned for its highly dark, challenging lyrics and violent sound influenced by free jazz, blues, and post-punk. In 2006, he formed the garage rock band Grinderman that released its debut the following year. Cave's music is generally characterised by emotional intensity, a wide variety of influences, and lyrical obsessions with "religion, death, love, America, and violence." Upon Cave's induction into the ARIA Hall of Fame, ARIA Awards committee chairman Ed St John said “Nick Cave has enjoyed—and continues to enjoy—one of the most extraordinary careers in the annals of popular music. He is an Australian artist like Sidney Nolan is an Australian artist—beyond comparison, beyond genre, beyond dispute."